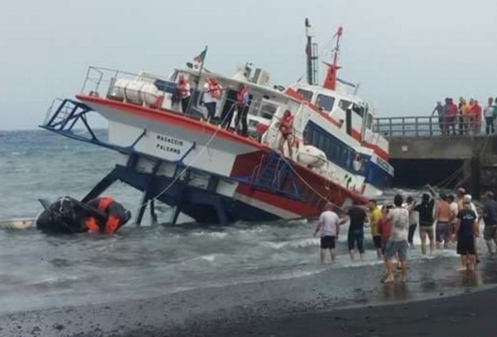 The Italian ferry Masaccio with 117 passengers on board sank after collision with the pier on Sicicilian island Stromboli. The vessel was proceeding to the berth, but the bad weather, strong wind gusts and heavy seas pushed her to the pier. 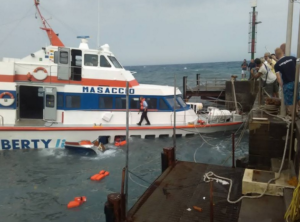 After the collision the passenger ferry Masaccio suffered serious damages and started getting water ingress. The draft of the bow increase significantly, as several compartments were flooded. 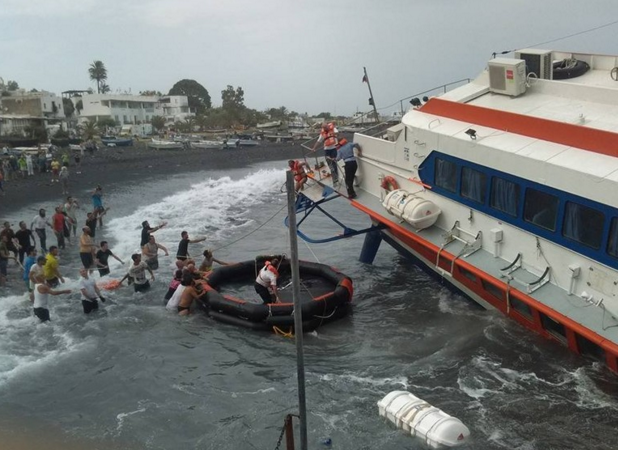 The local authorities dispatched rescue boats at the scene of the accident and disembarked all the crew and passengers. None of the passengers was injured, but ferry sank, as the waves continue to worsen her seaworthiness. The local authorities started investigation for the root cause of the accident. The vessel was maneuvering to dock, but failed to resist the strong waves. Currently the ferry sank, touching the bottom, but partially remained above the water. The Italian passenger ferry Masaccio (IMO: 8414702) has overall length of 32.00 m, moulded beam of 14.00 m and maximum draft of 3.80 m. The deadweight of the vessel is 21 DWT and the gross tonnage is 224 GRT. The ferry was built in 1988 by Rodriquez Cantieri Navali shipyard in Messina, Italy.